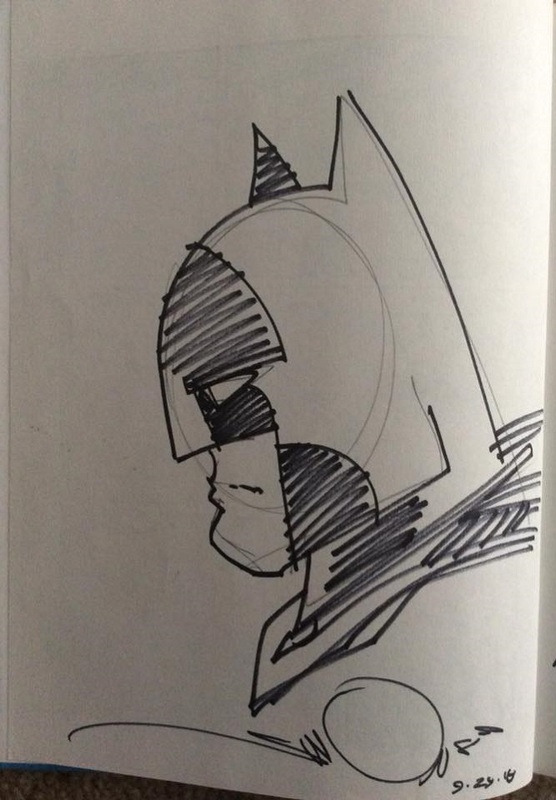 Dan, I saw that JB sketch on sale on Jim Warden's site, and I thought it was a cool item to get. I think having another artist draw on it is a horrible decision. Wouldn't you need the original artist's consent to do this? Is this common practice? That's an awesome JGL page, Fred! Tim, yes it is actually known as a “jam piece” a project that involves adding sketches from different artists to one page, something I know that many people do. This is being turned into a Fantastic Four jam piece, featuring Mr Fantastic, Thing, Human Torch, Invisible Girl, and Dr Doom. I bought the piece with the intent to add some great Fantastic Four artists to it, and so far I think it’s been a success. Even Joe Sinnott has agreed to add Human Torch to it, and I was very happy with how Zeck and Beatty’s Doom turned out. Trust me, I’m not adding any random modern artists to this thing, the artists I have on my list are worthy enough to contribute, I have high hopes for this piece. Don’t think I’d need consent if I already purchased the piece. I know what a jam piece is, Dan - it’s just that every jam story I’ve heard is commissioned as a jam piece. 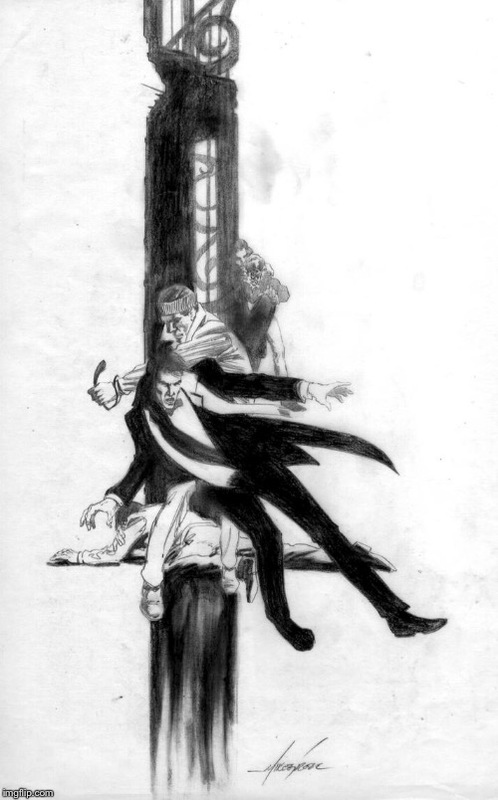 The original artist is in on the intent, including leaving room for others, or even sketching the position of the next figure on a team piece. I think you took too much liberty on this. I really don’t understand this side of fandom. I think you bought a unique sketchbook piece - a real gem. It just seems wrong to me. ....and think, HOLY CRAP, they ruined the page! ....and adding to it (especially if you can get FF artists like Sinnott to do it) seems like a terrific idea / neat piece of artwork. Hmmm. 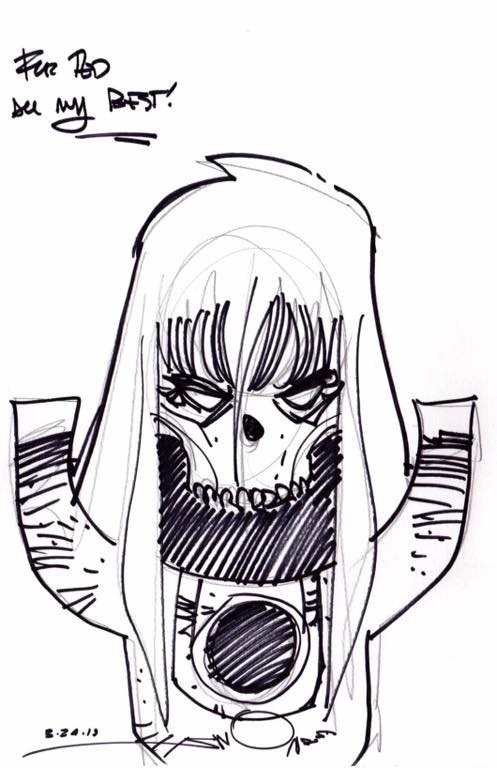 One of the cool things about the JB sketch was the negative space beneath Reed's gorget. That is now gone. The piece was also a document showing how much detail of the Thing was in the pencils and how much was added at the inking stage. That now is gone as well. Tim, this isn't the first time something like this has been done. I've seen many great jams started from an artist's sketch and turned into something much greater. 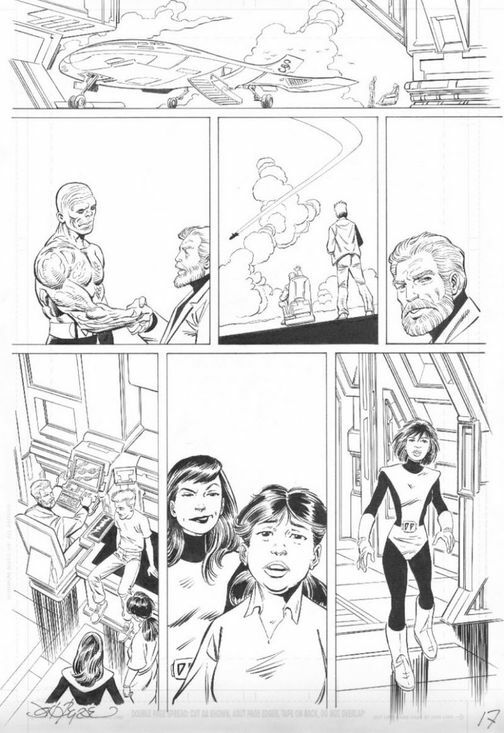 Someone else even turned a page of layouts by John Byrne into a jam, and it looks amazing. 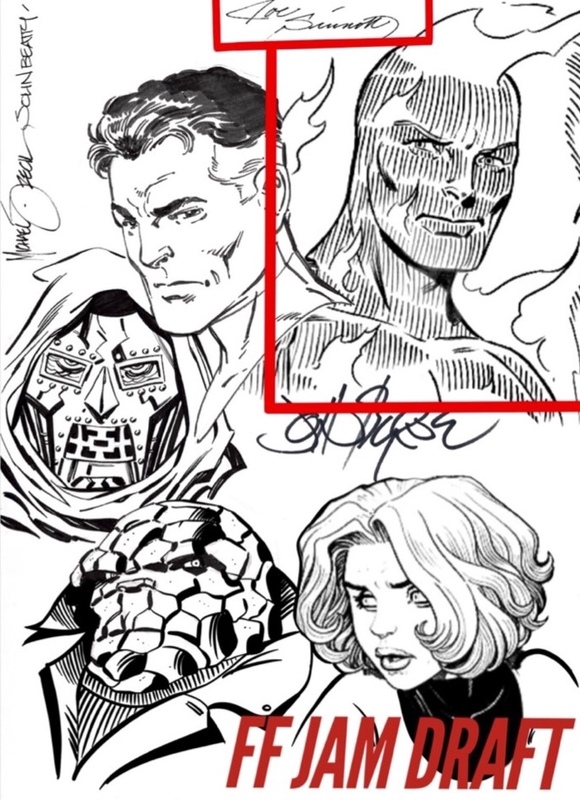 Also, Arthur Adams posted a picture of him inking a Thing sketch from John Byrne, and around it there are other head shots John drew, being inked by different artists. For those like myself who really wish to own a jam piece featuring John Byrne, this is the absolute only way of achieving it. 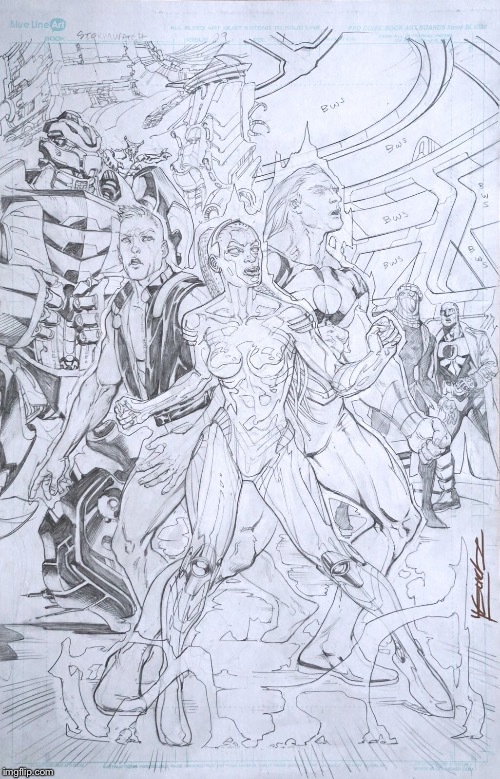 In my opinion, the sketch I purchased was a great fit for this, John unintentionally left space for the rest of the FF members, I'm guessing he was planning to add them until he stopped working on Thing. Mike Zeck was really thrilled with the idea when I showed him the piece, I guess some people have different views on this. Jason, thanks for the kind words! It's much easier adding other legendary creators once they've seen John Byrne on the jam, so it helps a lot. The artists I'd like to add are very talented themselves. Peter, the inks you're seeing on Thing is something I added very quickly. 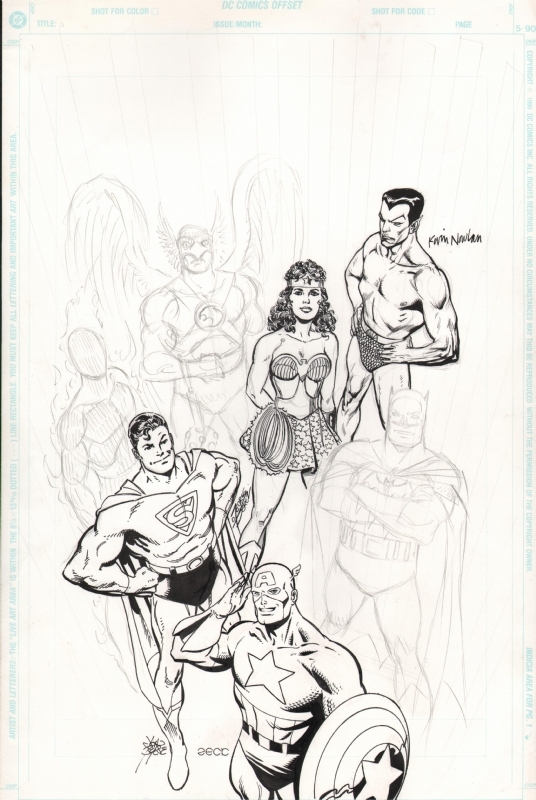 I'm hoping to have Art Adams ink Thing, and it'll look totally different from my version I inked digitally. I disagree with your overall on this, but this aspect is really an issue for me. A jam piece is something that happens at a convention or is commissioned as such. If you want a jam piece with JB and can’t get it because he doesn’t do conventions or doesn’t do the commission, then you don’t get your jam piece. Instead, you cheat it and make your own decisions about what to do with art. It’s a part of this art commission world that I find so distasteful - the person commissioning wants to play Jim Shooiter Junior, which would be fine if you weren’t messing with original art, in which each piece is unique. How do you approach the first artist on the piece? Did you tell them this was a sketchbook you bought, or did you present its origin as a jam piece? How acceptable is this process on the convention circuit? And I don’t mean how common jam pieces are - how common is it to take an artist’s work that wasn’t intended as a jam piece and have other artists work on it? 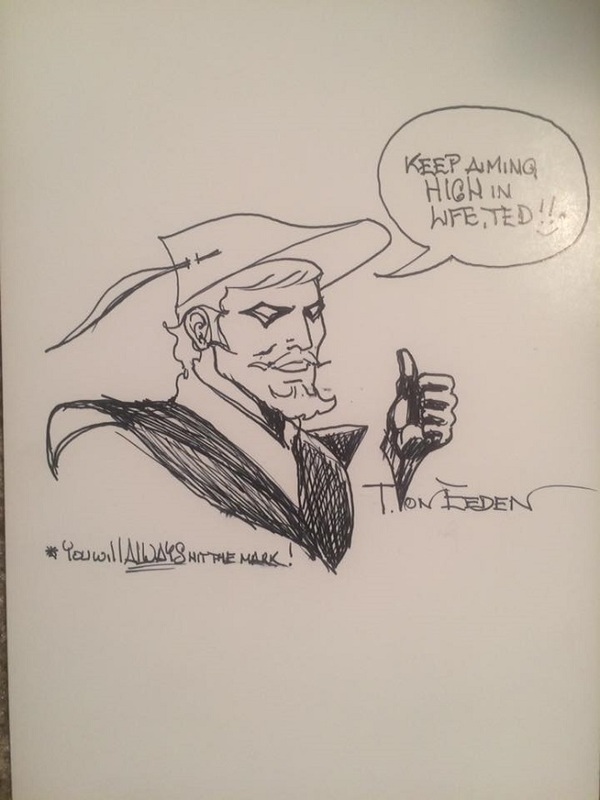 Tim, when I showed Mike Zeck and John Beatty this piece, I told them exactly how I obtained it, they’re both well aware that John Byrne doesn’t sketch anymore so they weren’t surprised or upset that I was turning his sketch into a jam. They both loved the idea and were very keen on adding to it, they also suggested other artists I should add to it in the future. The jam pieces I told you about were started the same way mine was. The only definition of a jam piece is obtaining sketches from different artists on one page, not all jam pieces are started with the intent of turning it into one. As I said before, people have different views on this, I received nothing but positive feedback on every other social media platform I posted this on, and from all the artists I have shown the piece too so far (they know exactly how this piece was started). Once this jam is complete, I don’t think it’ll end up as horrible as you think. Fred, those pages are incredible! A final goodbye. Doom Patrol #18, last issue. What ever happened to Nudge (Mi-Sun)? I can scratch FF #236 off of my list! 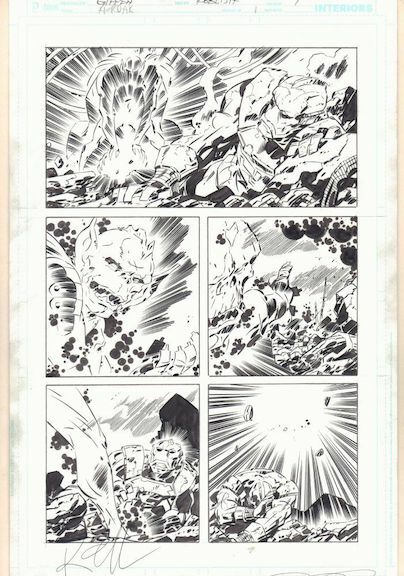 Probably the best page in my collection, and easily one of the top Ben Grimm pages of JB's run. Jason, what a great FF piece. That page is to die for, Jason. Congrats on that one. A memorable page from one of the best issues from one of the greatest runs on any comic. Congratulations! Would like to add that I think JB would be a great fit for a Stormwatch relaunch. Handling the character dynamics and interactions followed by his art style is just what the series needs. sketches. 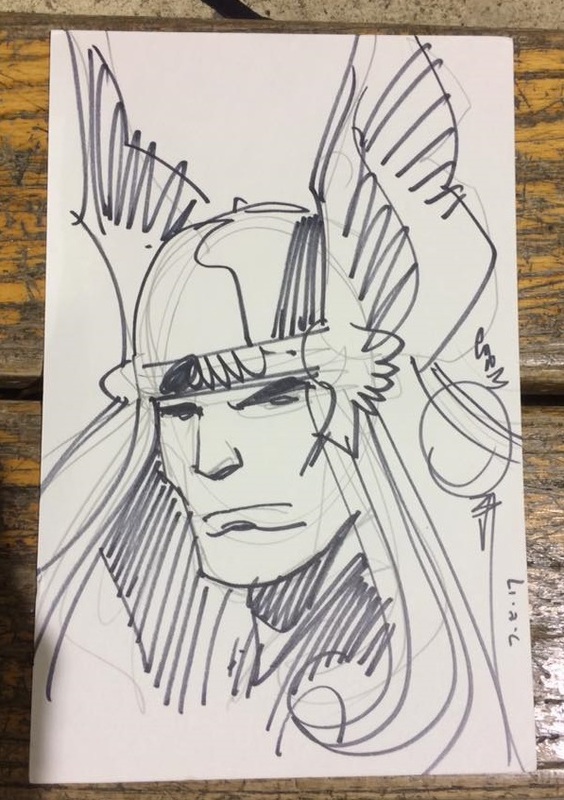 Here's a 'regular' Thor by Walter.